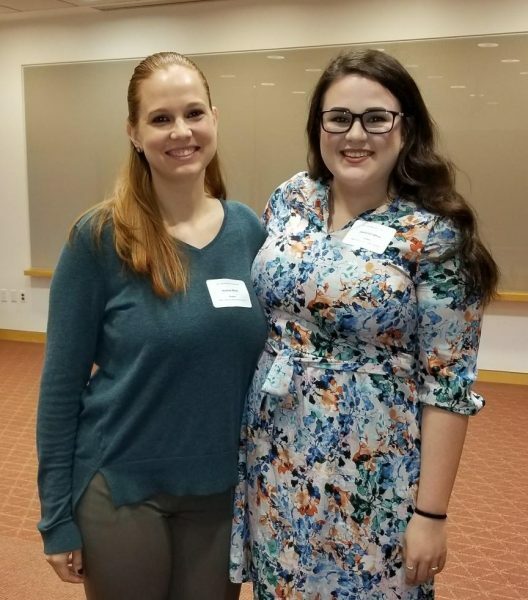 During the 2017 Indiana Society for Public Health Education (InSOPHE) Conference, Ms. Andi Miller and Ms. Jessa White, two students in the Bachelor of Science in Public Health – Community Health program at the Indiana University Richard M. Fairbanks School of Public Health – Indianapolis (IUPUI) participated in and won the Student Case Study Competition. Ms. Miller and Ms. White tied for first place with the University of Indianapolis for their study on reducing infant mortality rates in an Indiana community by addressing cigarette smoking during pregnancy through community intervention planning. Also on their team was MPH-SBS Alumna and president of InSOPHE, Ms. Tiffany Kerrigan; FSPH adjunct faculty and conference presenter, Ms. Shawnté Elbert; FSPH faculty and conference presenter, Ms.Charity Bishop; and FSPH adjunct faculty and InSOPHE past-president, Ms. Lisa Smith. Held at the Ball State University Alumni Center this year with a “Faces of Public Health” theme, the InSOPHE conference allowed students to present in the Closed Student Case Study Competition, attend a Case Study Winners Presentation, as well as participate in round table presentations, networking opportunities, and panel discussions. InSOPHE is a professional organization for health education leaders throughout Indiana, formed to create an environment in which health education/health promotion professionals could meet, exchange ideas, develop relationships, explore the latest trends in health education and health promotion, and learn from each other and other professionals.